The end of May is a melancholy time for me. Sure summer is here in full force and its time for the Indy 500, but it also means that the end of crawfish season is near. 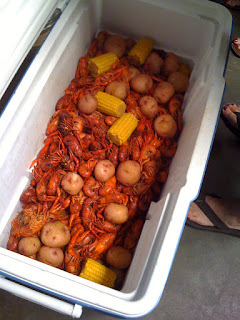 Luckily, we had a crawfish lunch at the store last Friday. That’s one of two coolers full of crawfish, courtesy of the Crawdad Hole on Lakeland Drive. 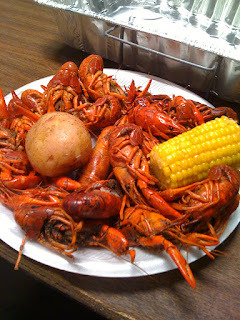 Normally, we would have served Crawfish Hut crawfish, but a $250 prize gift card from a golf tournament said otherwise. 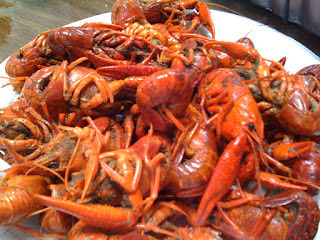 I apologize for the low resolution pictures, but once I got a taste of the crawfish, I knew an Iphone would be more than enough. Being so late in the season, the crawfish aren’t badly sized. Unfortunately, these bottom-dwellers suffer at the hands of the Crawdad Hole. Overly salty, and full of grit, I was immediately disappointed. I know that crawfish live in the mud, but there are ways to purge them. It seems that the Crawdad Hole missed that lesson in Crawfish 101. All grit aside, I want to revisit the saltiness. There was no real kick to these crawfish. I suspect they used a jumbo bottle of liquid crab boil, meaning plenty of salt for preservatives, but none of that delicious spice that I look for in crawfish. Regardless of the flavor, people rarely turn down a free lunch. We soon had small mountains of shells piling up, and within a few minutes, there wasn’t a whole crawfish to be seen. 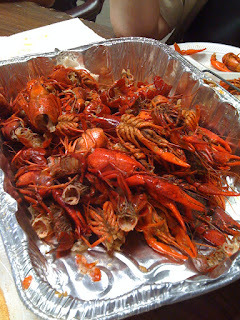 Seeing as it’s the first week of June, I’m going to do my best to enjoy that last few weeks of crawfish season. For me, that means I’ll be paying a number of visits to the Crawfish Hut and I’ll make sure to stay far away from the Crawdad Hole.